Avi's Embrace is a division of Project Sweet Peas that is dedicated to providing comfort to the families of Indiana by donating packages for those with a child in the ICU as well as to families suffering the loss of their baby. 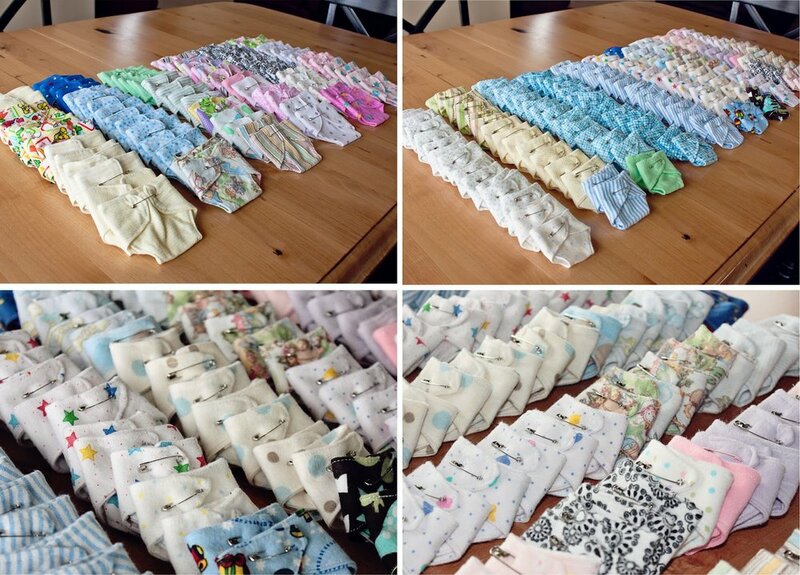 We at Teeny Tears are honored to provide Avi's Embrace with 50 diapers for their bereavement donations -- handcrafted by our very own Jana, Carol, and friends! 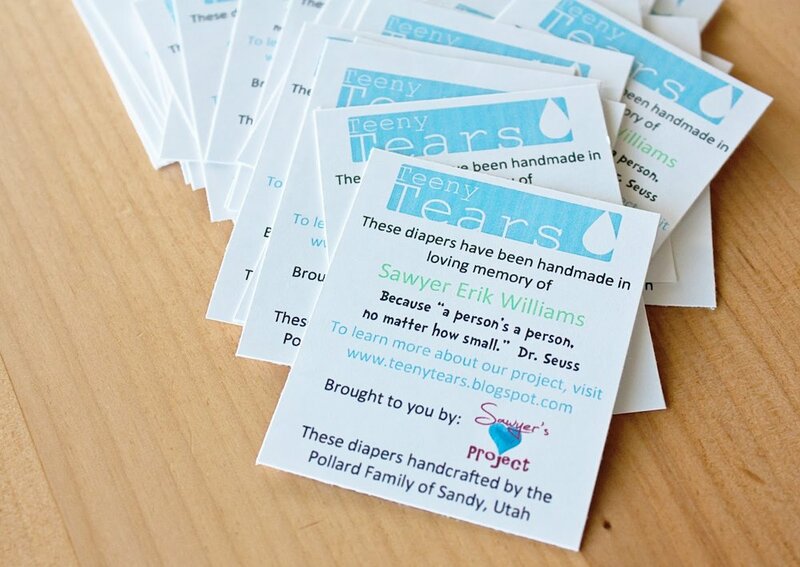 These diapers have been donated in memory of Charles Avi Edward. Learn more about Avi's story and see how Avi's Embrace is making a difference by visiting their website or by finding them on Facebook. My sweet TTTS friend Lisa is very involved in her local NICU Family Support program. One of the many ways she shows her love for the NICU families in her community is to donate micropreemie angel clothing and remembrance tokens to those who have lost their valiant battle. This year, she added Teeny Tears diapers to her donation. These clothing items may look big, but they are actually very very tiny -- for angels under two pounds. All of these items have been donated to Inova Loudoun Hospital in Leesburg, Virginia in loving memory of her beloved angel son, Daniel Carl Hutchings. So missed, so loved, and so very dear. But in our hearts you're always there." "In November of 2007, our daughter Olivia was born. Weighing 3lbs. 9oz. and a length of 16 inches, she was tiny for 37 weeks. She had Polycystic Kidney Disease and lived a short 1 hour and 53 minutes, which was more than we could have hoped for when we were told the diagnosis at 19 weeks pregnant. Throughout my pregnancy, while others would have been buying things for a nursery, we were preparing for her funeral. My dad built her casket and my mom had a burial dress made. I remember the day we picked out her plot at the cemetery while she kicked around inside me, it broke my heart. My doctor had referred me to a program at the hospital called Forget Me Not, which gives supportive care for families with unborn infants diagnosed with life-threatening or life-limiting conditions. We were able to plan our birth and ask questions and just felt like we weren’t going to be abandoned. During our time in the hospital, we were able to bathe, dress and photograph her. Her big sister, Brinley, was able to meet her as well as many friends and family. We had molds of her hands, feet and face made (some of my most favorite possessions). The hardest thing was handing our sweet baby girl over to the chaplain before we left the hospital, empty handed. Three months after Olivia’s death, I was asked to consider doing photography for the same program that I had just gone through. I had wanted to give back to the program and this was perfect for me. I said yes. Four+ years and well over 100 babies photographed later, I am now on the Forget Me Not board and am the photography coordinator. After a particular session, a mom, who had known her daughter would not live, had made her a small diaper, knowing that she wouldn’t be big enough to wear the preemie diaper the hospital would provide. The idea came to me, "Make tiny diapers." My first set of diapers were donated in honor of my daughter, Olivia. I had so many nurses and others asking about a pattern, that I posted it on my blog. My goal was to give families one more thing that they could take home. I had no idea how big a reaction my little diaper patterns would make. Megan has kindly kept me informed of all the places the diapers are being sent. I get super emotional every time I get a new email telling me that more families are able to cover their little baby’s bum. I am so very happy that so many people see the need for them and it seems they are spreading like wildfire! Megan is just amazing. She has done so much to help families through Teeny Tears. We have never met in person, but I do know her sister. 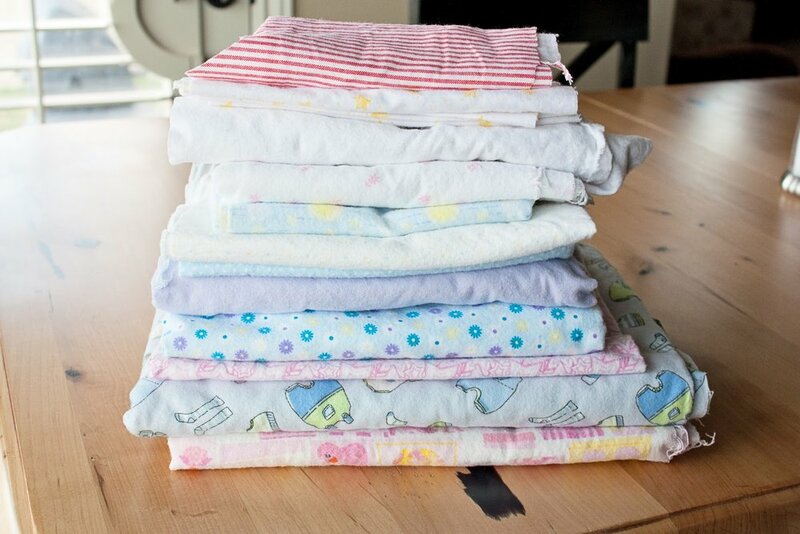 I would also like to personally thank all of you who have helped make diapers. It may have made the loss just a little more bearable by knowing that their tiny baby meant something to someone else too. And to leave you on a happier note, just three days before Olivia’s 1st birthday, we welcomed her little sister, Sarah, into our family." When my friend Jana emailed me for the first time about making diapers, I learned that she was raising a TTTS single surviving former micropreemie. Naturally, I assumed that she had crossed paths with me in the TTTS Facebook groups. Not so! She found me on Pinterest and the rest of our commonalities are mere "happenstance". If I believed in "happenstance". And I don't really. Last Christmas Jana donated stockings and gift bags to her local NICU. Teeny little diapers were right up her alley. Jana is actually combining two of her projects into one at the moment (and writes about it in a way that cracks me up). Check it out! Jana is donating her very first set of 60 diapers to the angels born at St. Joseph's of Bellingham, Washington. They have been created in memory of Jana's son, Carter Garen Kimmel. This is Carter's twin brother, Cohen. He and Carter would have fit in that teeny little diaper when they were born. He's Jana's right-hand baby in the project (as you can read on their blog). Crystal and I have many things in common, including a stillborn child. Emma Catherine would have been 11 years old this past February. 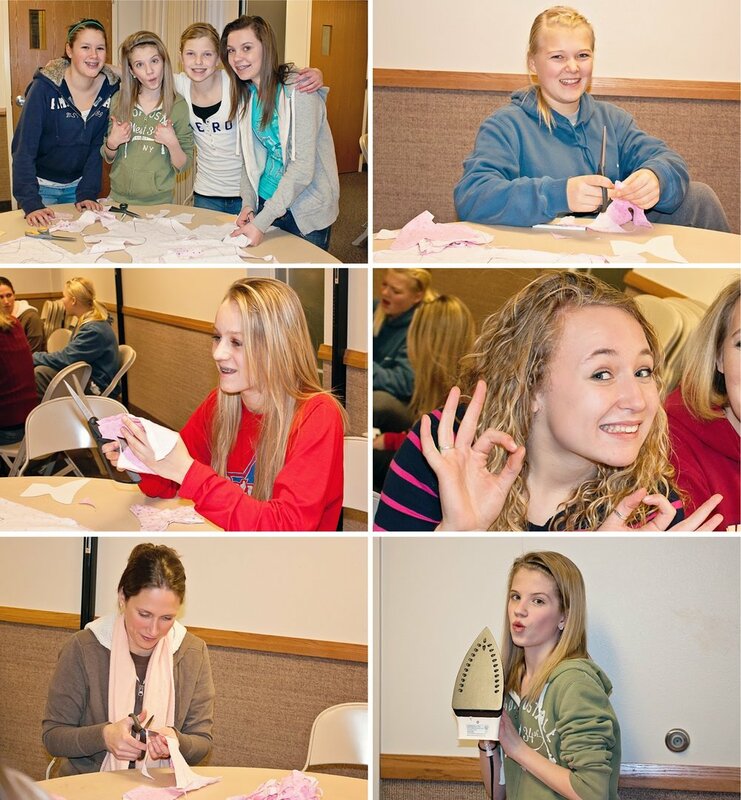 In memory of their special angel, Crystal and her girls sewed their first batch of diapers, donating these 16 beautiful little treasures you see below to Genesys Regional Medical Center in Grand Blanc, Michigan. The good folks at Genesys took care of Emma and her family during the beginning of their journey 11 years ago. I know that the angel families at Genesys will really appreciate the special donations made in honor of their lovely, beloved Emma. "Just before taking the diapers up to the hospital, the girls and I sat and prayed for the families that would be receiving a diaper. As I was walking out the door Sissy said, "Wouldn't it be neat if a family needed one of these today?" The innocence of a child right? Of course it would not be "neat"...sadness, grief and destroyed dreams accompany these diapers, but yes, it would be neat to fill a void for one of those families. My biggest prayer is that God provide comfort to a family that suffers an infant loss and if the family is not a believer, that somehow, God uses their experience to draw them near to Him. Heretofore, we have donated primarily to large, high-risk hospitals and regional support organizations that service multiple facilities. It hasn't been intentional; it's just the way it's worked out so far. Many hospitals (I would venture to say most hospitals) do not need a gargantuan supply of micropreemie diapers for their bereavement needs. This little batch of 24 diapers will be donated to the Labor and Delivery Unit of Riverton Hospital. It will meet their needs for quite some time. The bunny fabric was dropped off on my doorstep anonymously one night and I think the pattern is so cute. 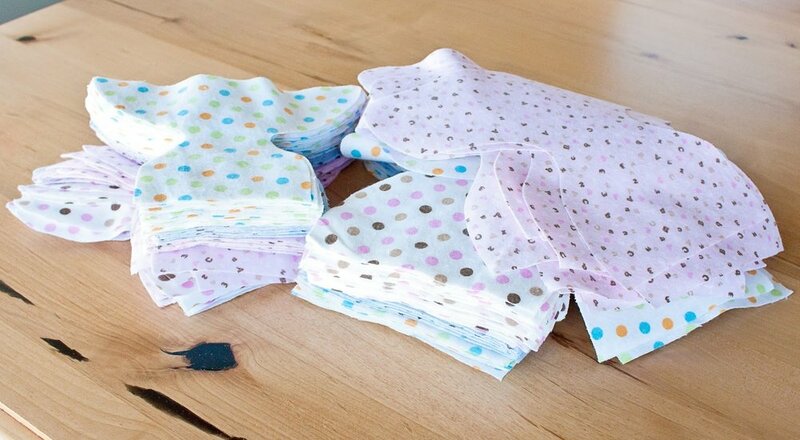 My friend Terrah saw the diapering possibilities in leftover flannel fabric that she had purchased for another project. She dropped her stash off on my doorstep and I was able to turn them into 16 diapers (8 tiny ones and 8 "big" ones) for Utah Share of Davis County. A little fabric goes a long way! Thank you, Terrah!